Friday was a difficult day for Lallie though. It was her very last day at Montessori school before starting Voluntary Pre-Kindergarten in the fall. She is going to church camp all summer, but we've been prepping her for the change in schools and Friday afternoon was filled with tears as we left her old school. Her teachers were crying as was Lallie and she looked at Miss Kiera and said "I'm never going to see you again". It broke my heart, especially as we drove off and Lallie realized that she forgot to hug and say goodbye to some of her friends. I almost turned around, but knew that carline is already a zoo, I felt horribly for her. But....she's getting older and we're moving on to bigger and better things. And by Friday evening, she was just fine. Though, we will miss her old school greatly. Here's a picture from Lallie's dance recital last week! She did so well, followed her teacher perfectly. We are so proud of our little ballerina and she can't wait to go back to dance class in the fall. Saturday, we headed out on the boat to the sandbar where we bumped into our friends Niki and Sean and their two kids Turner and Merritt (two of her friends from Montessori. She told them "see you at school" as we left....heartbreak). Look at these Lilly Lovers, are they not the most adorable things? Sunday, Lallie had her fingernails and toenails painted in what else....but pink! After they dried, she wanted to ride her bike and show them off. So she put on her pink sandals, her green and white polka dot sunglasses, her pink helmet (safety first) and rode her pink bike around the neighborhood. She's quite the miniature fashionista! Husband caught these two little rascals in our garden last week. Not that we're eating the lettuce anymore (hence the lettuce trees), but they are eating up our tomatoes, beans and onions! Gah! We're not eating the lettuce as we couldn't keep up with the production. We had lettuce coming our our ears and eventually, it became to tough to eat. Next year....not as much lettuce! Now, what to do about these "little varmints" to quote Yosemite Sam! I've changed up my book tracking and reviews. I've joined Good Reads where I can keep track of what I've read, what I want to read and what I'm currently reading. I know several bloggers that are on Good Reads and will *hopefully* becoming your fried. So, if you so desire, check out my bookshelf and join me and reading fabulous literature! AND, last but not least. Don't forget about What's In It Wednesday! This week is your handbag or purse! So take pictures, review your favorite products and link up with me on Wednesday. I may even be able to get Ashleigh to review her bag....so you'll get double the product reviews! Love your photos! Lallie is just precious. Glad y'all had such a great weekend! I love goodreads. And they have an app. I use it when I am at the library to check my to read list. The weekend looks like a blast. 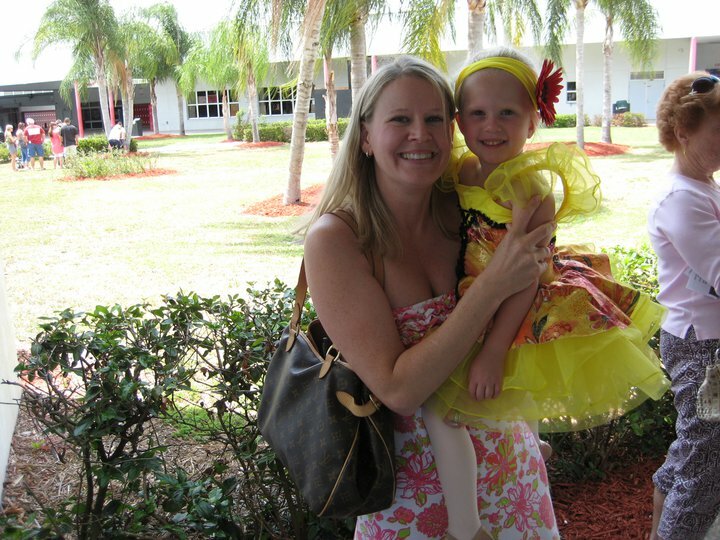 That picture of you and Lallie after her recital is lovely! You look so pretty and of course, she is precious in her costume! I just found your blog, and I'm sure glad I did! Your daughter is the cutest little lilly-wearing thing! I look forward to reading your posts! Those pics are too cute! The boys in their Lilly shorts are just adorable. Bless sweet Lallie's little heart! Changing schools is always a bittersweet thing. She is going to be gone to church camp all summer? What are you going to do without her?! I haven't grown lettuce and my garden is a mess; everything except what I have in my pots and the space behind the pool. I've got to get it cleaned up!! Adorable! I love the one with her little pink nails held out for the camera. As always Lallie is too cute! You never know either, her friends from school may cross paths with her again.